LOCATION: Robert Service Memorial Park, Cowichan Bay, Duncan. DIRECTIONS: When you’re driving on Cowichan Bay Road on Vancouver Island, towards the village, just past the South Cowichan Lawn Tennis Club, at the little bridge on the right, you can find a Robert Service memorial bench, near the intersection of Cowichan Bay Road and Bench Road. 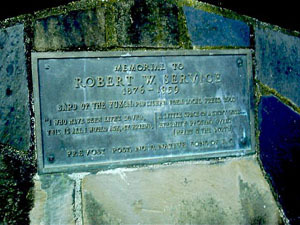 Although he’s mainly associated with the Yukon and the Klondike gold rush, Robert Service, one of the most successful and widely known poets or ‘rhymsters’ of the 20th century, also lived for four years near Duncan on Vancouver Island, having emigrated from Glasgow in 1896 with $15 in his pocket. He arrived on Vancouver Island with visions of becoming a cowboy. According to the Cowichan Valley Museum, Robert Service worked for the local Corfield family doing all kinds of jobs but he was best known for working in the Corfield Store on the Koksilah River. He also served as a part-time school teacher for the children on the Corfield farm and participated in local theatricals. The “Canadian Kipling” published his poem while in the Cowichan Valley, on December 5, 1903, in the Duncan Enterprise–a poem about the local swimming hole. 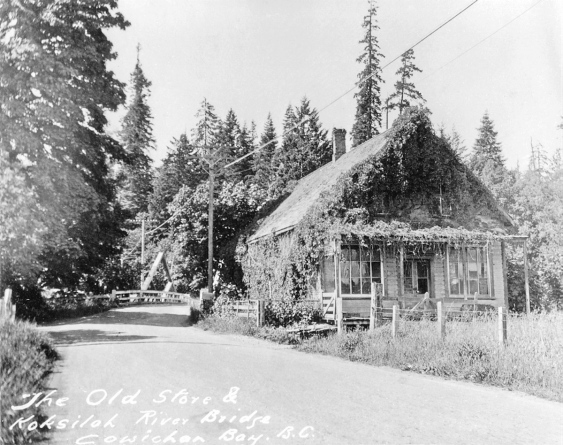 Service reportedly wrote twenty-five poems while in the Cowichan Valley. Before his worldwide notoriety as the Bard of the North, Service had spent seven years on Vancouver Island, from 1896 to 1903. A cairn and two benches mark the former site of the Corfield Store where Service worked. The stone cairn, erected in 1958, recalls pioneers who arrived on the H.M.S. Hecate in 1862. A stone bench was built for Robert Service in 1959. A year later a second stone bench was added to recognize early pioneer women of the Cowichan Valley. 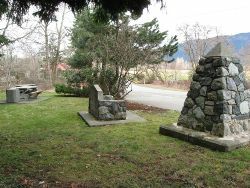 This memorial park was created by the Prevost Post of the Native Sons of B.C. to recognize the early European settlers within the Cowichan Valley. In Scotland, Service had dabbled in Socialism and worked in a bank. Eager to test himself and become physically stronger, he saved his money, quit his banking job at age 21 and sailed steerage class to Montreal, carrying with him a copy of Robert Louis Stevenson’s The Amateur Emigrant, a letter of reference from the bank and a Bill Cody outfit. Corfield’s Store, on the bank of the Koksilah River. 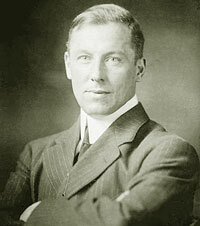 Robert Service returned to British Columbia from California and enrolled in the University of Victoria in 1903, planning to become a teacher, but he failed in two courses. Destitute, he was only able to get work as a teller in a bank at Fort and Government. The Canadian Imperial Bank of Commerce in Victoria sent him to Kamloops in 1904, then onto their branch in Whitehorse where he often entertained at church and social events, reciting poetry. A friend suggested he write his own. According to Service, the famous opening line of The Shooting of Dan McGrew, “A bunch of the boys were whooping it up in the Malamute Saloon” just popped into his head as he was passing a Whitehorse bar on Main Street. He supposedly went to the bank and stayed up all night finishing the poem. 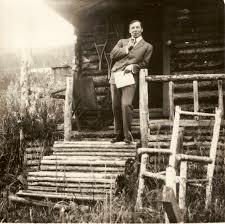 In 1908 Robert Service was transferred to Dawson City where he wrote his second popular book, Ballads of a Cheechako. 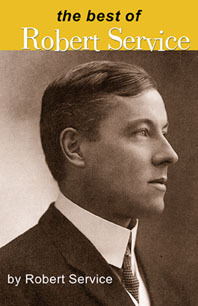 Robert Service left the north in 1912 to visit the Balkans as a correspondent. He married a French girl named Germaine Bougeoin in Paris in 1913. During World War II he was a correspondent and stretcher bearer. After the war he lived for a time in Monte Carlo. During World War II, when Service lived mainly in Los Angeles, he appeared alongside Marlene Dietrich in a 1942 Hollywood film called The Spoilers. Some of Service’s novels and his Dan McGrew poem were used as the basis for movies. Service’s output included some 2,000 poems, not all of which have been published. His published work included 13 poetry books, six novels, two volumes of memoirs and a book on physical fitness. 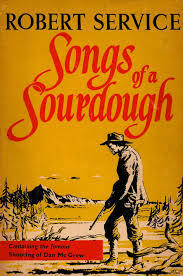 It was Robert Service who advised Robert Swanson to write his bunkhouse ballads about the logging camps of the West Coast. Swanson took the advice, duplicated Service’s sing-song yarns and became British Columbia’s bestselling poet of the 1930s and 1940s. Service was born in Preston, England on January 16, 1874. He died in Lancieux, France on September 11, 1958. Carl F. Klinck and Keith Richardson published a biography, Robert Service, in 1976. Other biographies include James MacKay’s Robert Service: Vagabond of Verse and G.W. Lockart’s On the Trail of Robert Service. The most extensive collection of manuscript sources and ‘Serviciana’ is at the Mitchell Library, North Street, Glasgow. The Yukon Archives in Whitehorse also has considerable holdings. Pierre Berton, whose mother was once asked to dance by Robert Service in the Yukon, interviewed Service for three days in Monte Carlo shortly before Service’s death. Robert Service’s rustic cabin in Dawson City is preserved as a heritage site. Very few people know his presence on Vancouver Island has also been commemorated. His early work is in the public domain in the U.S. but in Canada the copyright will remain in effect until 70 years after Service’s death, or until 2028. And Kipling, my friend, is at hand. For I’ve never been guilty of that. “Of those he made famous through his writing, “The Ragtime Kid,” Hartley Claude Myrick, passed away in Seattle in July 1950. “The Lady known as Lou,” cabaret singer Lulu Johnson, was drowned when the Canadian Pacific Steamer, Princess Sofia, sank in the Lynn Canal on October 25, 1918. And Sam McGee, a Dawson prospector whose name Robert had lifted from the Bank ledger and who actually came from Lindsay, Ontario, left the Yukon in 1909, settled in Great Falls, Montana, and was eventually decently interred in Beiseker, Alberta, having spent much of his life responding to queries about whether he was “warm” enough yet.” — Murray Barkley, website. Stumbling on a hidden cache of letters, discovering a secret love affair, identifying a mysterious figure in the subject’s life—these revelations are stuff of fiction by the likes of Henry James and A.S. Byatt. Robert Service: Under the Spell of the Yukon (Heritage, 2006 240 pp.) 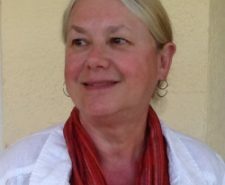 by Enid Mallory proves that such surprises do unravel for real life biographers as well as fictional ones. Enid Mallory is the first of Robert Service’s biographers to make extensive use of recently discovered letters written to an early love (although she did not find the new material herself). For anyone unfamiliar with the man who wrote some of the most-repeated poems ever written in Canada—most notably the “The Cremation of Sam McGee” and “The Shooting of Dan McGrew”—Service emigrated from Glasgow in 1896 with $15 in his pocket and his visions of becoming a cowboy. Service had quit his banking job at age 21 and sailed steerage class to Montreal, carrying with him a copy of Robert Louis Stevenson’s The Amateur Emigrant, a letter of reference from the bank and a Bill Cody outfit. Recent revelations about previously unknown letters by Service came about serendipitously when his previous biographer James Mackay speculated in a 1995 radio interview about the identity of C.M., the dedicatee of Service’s first book Songs of a Sourdough. One of C.M’s granddaughters happened to hear the program and she called radio host Tom Allen to tell him more about the relationship. This romantic episode of Service’s life has a special interest to British Columbian readers because the young woman in question, Constance McLean, was the daughter of Malcolm McLean, who in 1886 became Vancouver’s first mayor. Although his tenure as mayor was brief, he pulled the city together after the Great Fire that devastated the city the year he was elected, and he set aside the land that became Stanley Park. He later served as police magistrate for the city until his death in 1895. The love affair between Service and Constance McLean percolated while he was working on the Eureka stock farm in Cowichan Bay on Vancouver Island. It was the biggest farm in the district, established in 1883 by George Corfield, who built up great herds of Holsteins and Jerseys. When Service first arrived at the turn of the century he served as Corfield’s official cattleman. He was relieved from this grueling work only he was tossed into the air by a bull. After he was injured, Service became the storekeeper on the Corfield ranch and he was hired to tutor Corfield’s sons. During his four years at Corfield’s, Service attended dances, sang in the choir at St. Peter’s Quamichan, joined the South Cowichan Lawn Tennis club (the earliest club of its kind in Canada), acted in theatrical groups and entertained by playing the guitar. During one dance at nearby Duncan’s Station (the forerunner of present-day Duncan), he met Constance McLean who was visiting her uncle in the district, Dr. Perry. Service was so smitten, he went back to his attic room and wrote “The Coming of Miss McLean” and promptly mailed it to her. This previously unpublished love poem, which Mallory includes in her book, was in the cache of letters that McLean’s daughters found in 1960. The originals are now in Queen’s University Archives in Kingston, Ontario. The dancing fair, entrancing Miss McLean. Service is world famous for his fanciful rhymes about the Klondike, but Mallory notes that some of his earliest poems were printed in Victoria’s Daily Columnist after the editor met him on a fishing trip to the Cowichan Valley. Constance McLean seems to have been the inspiration behind his first major publication, a poem called “Apart and Yet Together,” for which he received the princely sum of five dollars in 1903. It appeared in Munsey’s Magazine, a New York journal with a circulation of 700,000. Service was notoriously reticent about his personal life so the identification of Constance Mclean and the poem are significant discoveries. Service wrote two autobiographies late in the game, Ploughman of the Moon: An Adventure into Memory (1945) and Harper of Heaven: A Record of Radiant Living (1948), in which he generally withheld the names of family and friends. Such omissions may have been a legacy of the embarrassment he suffered after choosing the name Sam McGee randomly from the list of bank clients when he worked in Whitehorse. After “The Cremation of Sam McGee” became popular, the owner of the name turned up and withdrew all his money from the bank. Service’s other reason for not mentioning his first love was that the protracted relationship was a painful memory. When they first met, Service was in no position to support a wife, let alone propose marriage to a socially prominent Vancouver woman. This predicament was similar to the frustrated romance that adversely affected Thomas Hardy for the rest of his writing days. Service’s experience as a bank clerk in Scotland helped him to find a position at the Bank of Commerce in Victoria. He and Constance continued to exchange letters and meet for some time after the bank had assigned him to its branch in the Yukon. Only Service’s side of the correspondence has survived, and it indicates that during a 1908 leave in Vancouver, Constance agreed to marry him. Again, Service was stymied by social convention. The bank had a policy forbidding its employees to marry until they possessed thirteen hundred dollars. At the end of his leave, he wrote movingly to her of his misery aboard a ship that was taking him back up north, towards the Yukon. Service’s autobiographical account of this period paints a different picture. There he accentuates his delight at returning to the Yukon. Perhaps there is some truth in both, for soon afterwards the affair lost its intensity, became a friendship, and eventually ended. Ultimately it appears as if Constance’s most serious rival as Service’s muse was the Yukon itself. Until her side of their correspondence is discovered and revealed, the true nature of the relationship can never be known for certain.